The Gradishte Fortress near Chuypetlovo is a relatively unknown archaeological site which has not been excavated by archaeologists. Located at an altitude of about 1,200 meters in the Vitosha Mountain, it is known to have originally been built in the Late Antiquity, and later rebuilt in the Middle Ages, and to have been connected with metallurgy. “Gradishte", a Bulgarian word, is common name in Bulgaria used to denote fortresses whose original names have long been unknown or forgotten. The Turkish words “kale" and “hisar", leftovers from the Ottoman Yoke period in Bulgarian history, are also used for the same purpose. More about the history of the Gradishte Fortress near Chuypetlovo and the town of Chuypetlovo itself read in the Background Infonotes below. The two treasure hunters were caught red-handed on October 7, 2015, in a police operation in Pernik Municipality. Both men, aged 45 and 43, have criminal records, the press service of Bulgaria’s Interior Ministry has announced. The police have seized from them a large number of ancient and medieval coins as well as metal detectors, a georadar, and digging instruments. More coins and archaeological artifacts have been discovered in the homes of the two detainees. Treasure hunting is a rampant crime all over Bulgaria whose countryside is dotted with thousands of archaeological monuments from all historical periods. The Late Antiquity and medieval fortress Gradishte is located in the Vitosha Mountain, near the town of Chuypetlovo, Pernik Municipality, to the southwest of the Bulgarian capital Sofia. Its ruins lie on the bank of the Struma River, and cover an area of about 10 decares (app. 2.5 acres) on a site with natural defenses. The Gradishte Fortress near Chyupetlovo has not been excavated by archaeologists, and its area is covered by a forest today. Little is left of its walls and buildings including because over the centuries local residents used the ruins to extract construction material. First built in the Late Antiquity, i.e. the Late Roman / Early Byzantine period, the Gradishte Fortress was rebuilt in the Middle Ages, at the time of the Bulgarian Empire, when it was connected with the defense of the nearby Krakra Fortress, the predecessor of today’s city of Pernik. It is known that the Gradishte Fortress was also connected with medieval metallurgy. The nearby town of Chuypetlovo has an interesting history. Its name literally means “hear the rooster". It was founded in 1640 during the time of the Ottoman Yoke, i.e. when Bulgaria was part of the Ottoman Empire, by Bulgarian refugees from the Aegean Sea coast. 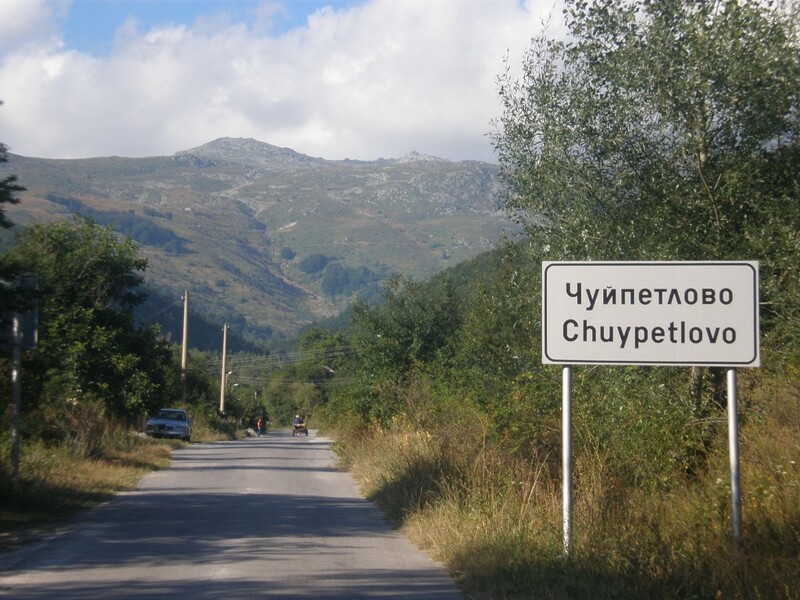 Chuypetlovo is the town with the highest altitude in the Vitosha Mountain. At an altitude of 1,200 meters, it was hidden in the forests of the Vitosha Mountain near Sofia. It was so hard to find that travelers could only find it by following the crowing of its roosters, hence the “hear the rooster" name. The town of Chuypetlovo remained rather isolated until the last quarter of the 20th century. It did not have a proper road to the outside world until 1972, and electricity until 1977.